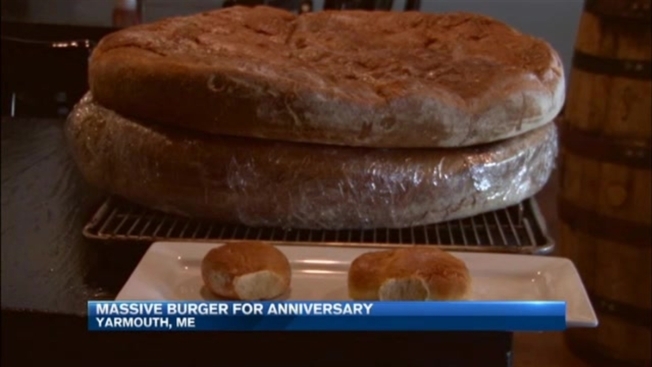 What started out as a joke became reality this past weekend when a Maine restaurant cooked up a 100-pound burger to celebrate its first year in business. WCSH-TV reports the owners of Dirigo's Public House in Yarmouth worked all day Sunday to cook a freshly ground, 70-pound beef patty that weighed in well over 100 pounds with all the toppings added. Co-owner Ben Grant says he and his fellow owners were looking for something creative to celebrate their restaurant's first birthday when someone suggested taking their burger to another level. Customers purchased tickets for a chance to get a bite of the massive burger, with a portion of the proceeds benefiting Good Shepherd Food Bank. Grant says it seemed inappropriate to do something this excessive without giving back.